This entry was posted in 3. 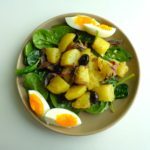 Salads and tagged anchois, anchovies, Collioure, potato salad, recette, recipe. Bookmark the permalink.